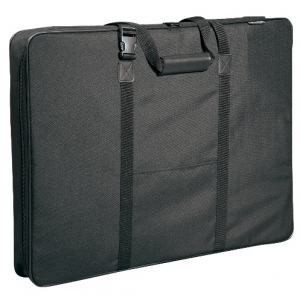 Constructed from lightweight black water-resistant nylon this soft art portfolio keeps important projects safe and organized. * Wire-sewn frame helps the portfolio to maintain form. * Inside is a zippered pouch to hold smaller objects as well as an oversized storage pocket for keeping artwork and papers safe and easily accessible. * An elastic cross strap inside holds larger projects securely in place. * The 3" gusset allows for expansion. * Handles convert into shoulder strap for comfort and convenience when carrying heavier projects. * Rubber feet protects portfolio from wear.